The Episcopal School of Dallas is grateful to announce a generous gift from Ginny and Conner Searcy that will further fund the Searcy Family Endowed Scholarship. This fund provides tuition assistance for qualified students who would not otherwise be able to afford an ESD education. "Both of our mothers were teachers who taught us the life changing impact of education as well as the importance of paying forward what others had done for us," Conner Searcy said of himself and his wife, Ginny. "We knew that once we were capable, we would we make this ideal a priority." 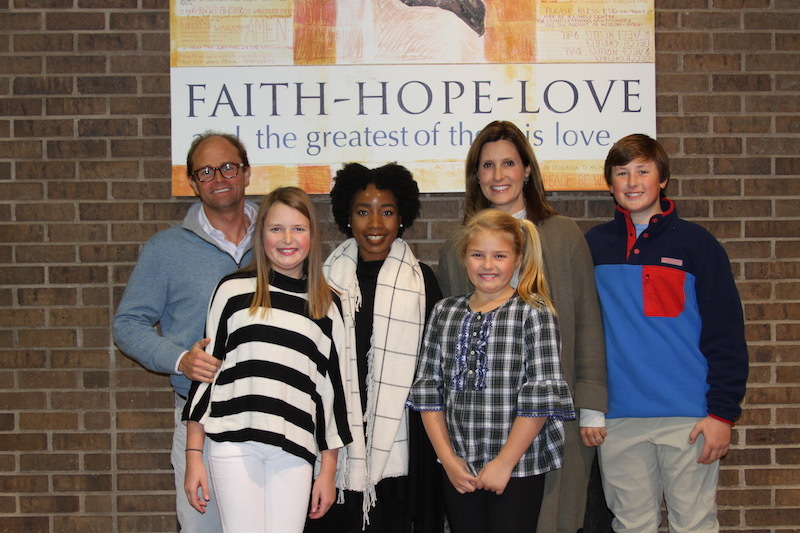 The Searcy family began the Searcy Scholar program in December 2009 to allow more students access to ESD's faith-based mission, focus on the family, and emphasis on the whole child. The first recipient was Asia Hawkins '13 (pictured at right with the Searcy family). Asia credits the ESD faculty and her AP classes with her ability to graduate from Texas Tech in three years. "Without the assistance of the Searcy Endowment Fund, my dream of attending ESD would have possibly been unattainable, and I am eternally grateful," explained Asia. "There are several notable hallmarks of an ESD alum. Relentless intellectual curiosity, lifelong wellness, and a faith-based foundation are a few that come to mind. One of the greatest values that ESD and the Searcys have taught me is the importance of giving back." Asia earned the President's Volunteer Service Award all four years of Upper School, completing more than 350 hours. In college, Asia volunteered for Reading is Fundamental and served as the president of the Student United Way group. She is now an active member of the ESD Alumni Association Board. Presently, 20 percent of students received financial assistance at The Episcopal School of Dallas, and over $3,600,000 was given for 2017-18. The average award covers 60 percent of tuition. Admission decisions are need-blind and based solely on the prospective student's ability to thrive at ESD. "Our sincere hope is that ESD enables an increasing number of financially disadvantaged children the opportunity to benefit, like our family has, from the faith, education, and community of ESD."